Adi(pencilslaugh), Aiza(aizafalconi) and I woke up early for a Congress on Social Media and Cyber-Ethics. While I listened to the speakers, the two (they admitted it) took a nap. Though I did not enjoy sitting in for a long time, I was happy to attend the said event. I learned a lot from the speakers. And yes, it was the second time I hear Kara David talk.The first time was during the Comguild Convention where she discussed making documentaries. This time she expressed her thoughts on their campaign Think Before You Click and on Cyberbullying. Soon, I got an SMS from Chopper(paresatbp) to meet with him in Cafe Noriter. Too lazy and impatient to wait, I decided that we should meet him at Becky’s Kitchen where he is buying a cake for a friend. We, the three of us, walked under the blistering heat of the sun. That time, I seemed to forgot that I don’t have a good sense of direction. I rely on maps+instructions. We ended up walking around a block with Chopper nowhere in sight. After the long hike, we went in the shop and enjoyed the ambiance brought by its interior. When Chopper appeared at the door, we moved to a cozier spot and ordered a slice of Swiss Chocolate Cake for Adi, a mug of hot cocoa for Chopper and a plate of waffles and fruit for me. 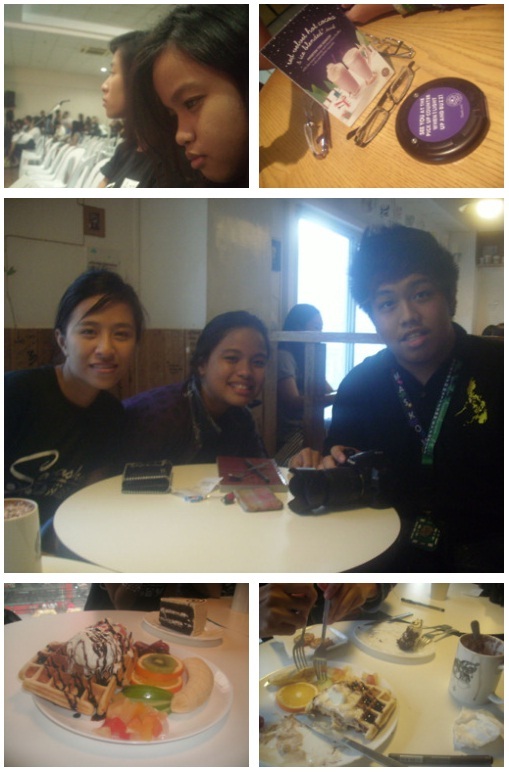 It was a great day for caffeinated drinks, sweets and bonding moments with quirky friends. We took a lot of pictures, had loads of conversations (both profound and mundane) and had fun in each others company.